In Oakland almost everyone I talked with, no matter what their political beliefs, complained about the Oakland Occupy protesters. 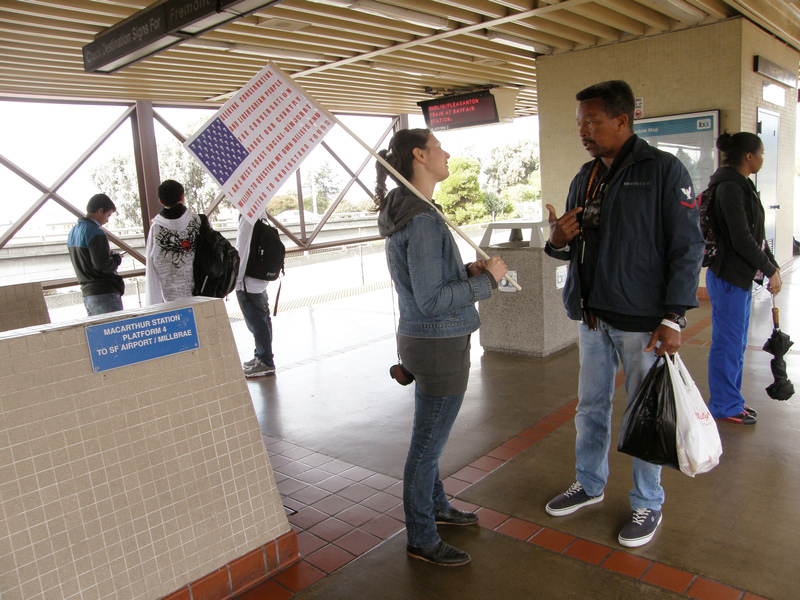 At the Macarthur Bart station a man came over to read my flag sign and then gave me some of his perspective. He talked about how it had taken him 4 years to get a job at the Oakland Port, and said that the jobs are hard won and vulnerable. In his opinion the port shutdown punished the independent operators more than the big corporations. He said the protesters are targeting the wrong places – they should be going after the big banks or the rich gated communities. The protesters seem to him – and other people I spoke with – to be outsiders who don’t have a stake in the city and are taking advantage of its economic and political weaknesses. While I totally agree with standing up for small business, I still think that we can not rely on business to be the only force that improves society, and that people must be able to insist politically that our country function for ordinary people, not just the very wealthy.